‘Believe in the Light so that you will be children of the Light’. We enable all children to be happy, confident and courageous. We offer opportunities for prayer and reflection, allowing God’s presence to be felt in an environment that is grounded in faith, celebrating the uniqueness of every member of our school community. 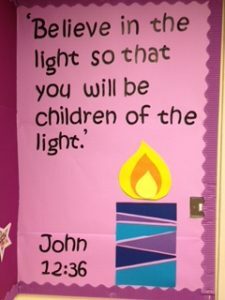 We create a positive learning culture with our catholic values at the centre, which challenges our children to be independent, confident learners. We promote inclusivity for all, ensuring all of our children have the opportunity to reach their full potential in a bright and stimulating learning environment . We encourage families and other community members to work closely with us in order to create a vibrant and successful school. We encourage children to be considerate citizens of a global community through acts of collective worship and community events.